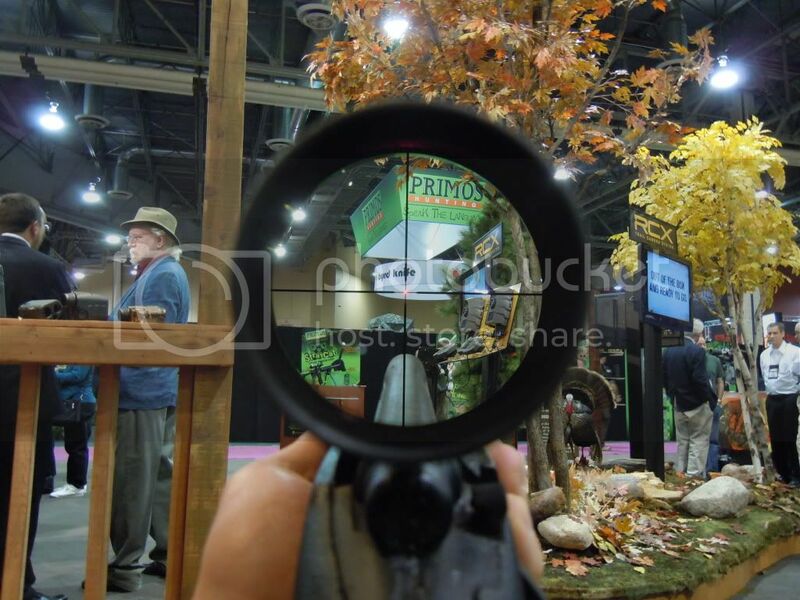 Shot show 2012 mini review of Leupold’s new offerings. As I approached the Leupold Tactical booth on the first day of shot show this was the was the first display my attention was drawn to. Ridding atop the M2 .50 cal machine gun sits the Leupold Mk 8 CQBSS 1.1-8x24mm rifle scope. 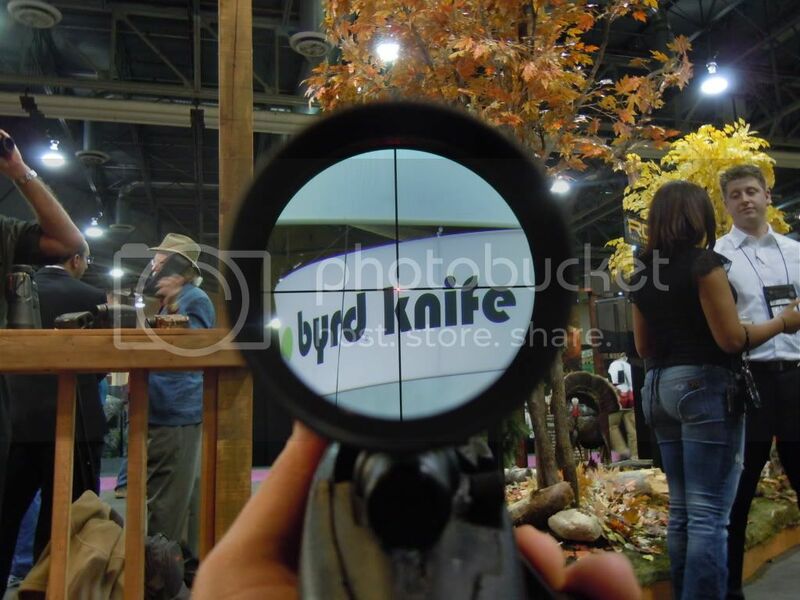 The casual observer might see this arrangement as a clever demonstration on the part of Leupold to demonstrate the extreme durability of their product in an, eye catching, comical, and unmistakably convincing way. Behold, a rifle scope that can stand up to .50 BMG…. At 500 rounds per minute. I admit to finding the arrangement comical in appearance. A non sequitur in firearms design. A sniper scope on a belt fed machine gun. None of this effect was Leupolds intention when designing this display. In fact, they felt offended when I referred to it as striking me as comical in appearance and I felt a little bad for bringing it up. 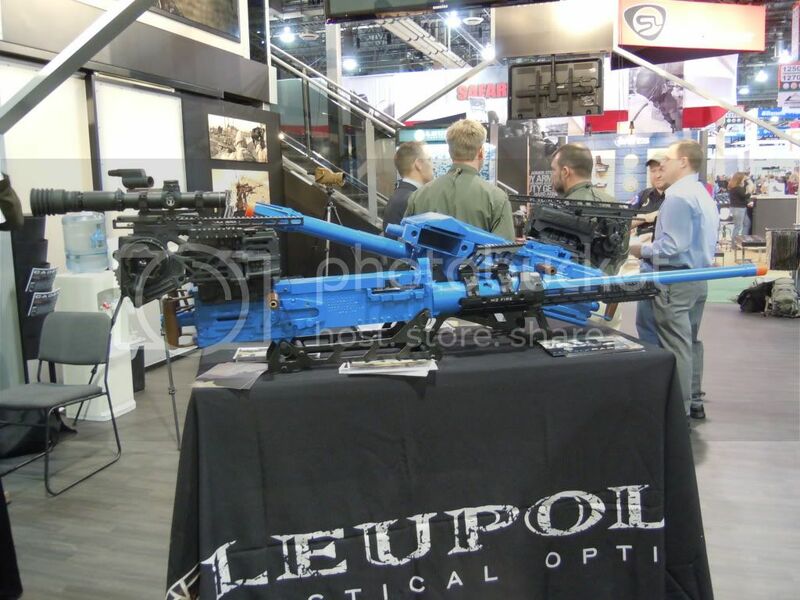 You see, Leupold has a contract with the Marines to produce the CQBSS for the M2 and also MK 19 platforms. The display is no marketing ploy, it is simply an example of the product in use. Marine gunners, particularly in Afghanistan, often engage targets, who appear only marginally different from civilians, at quite exceptional ranges. Having an 8x magnification capability on your vehicle mounted machine gun or grenade launcher is not a bad idea for spotting your. In fact, the record for the longest combat kill at 2,286 yds was held by one Carlos Hathcock from 1967 all the way up until 2002. He accomplished this feat by mounting a 10x Unertl scope on an M2 machine gun and working the trigger in such a way as to fire a single round at a time. The Marines have a long memory. For the record, I still find it comical to mount a sniper scope on an M2. I found it comical when I read it in Hathcock’s biography and I bet his fellow Marines found it comical back when he first suggested the idea and then designed the mount to accomplish it. This Shot was also my first opportunity to handle the CQBSS in person. Now, for most of the other scopes that I have reviews of there is a side by side comparison of the scope being reviewed with my reference GRSC scope as well as a discussion of the comparative optics performance. That is because those manufactures booths do not resemble the front gate of Ohio stadium at the end of a Buckeyes game and so a writer has a place to sit down and do some comparisons. The Leupold Tactical booth will not be winning any awards for booth design I’m afraid. It was not very large, did not have any seating, and given the number of new and interesting products being introduced into the market it was something of a mob scene. What I will tell you is that the CQBSS looked good when I examined it as best could be done in the situation. The unique spring loaded locking pinch turrets seemed to work fine. And the optics were clear and didn’t show any obvious optical problems. The Leupold folks did their best to be accommodating in the situation but it was just a pretty busy place. At this point you are probably thinking that while pontifications on the deployment strategy of the CQBSS are well and good you are much more interested in reading mini reviews on the new Mark 6 and 8 scopes. I’m afraid that while these were at the show and no doubt you have seen and heard about them from others they have an NDA attached to them and are not officially released yet so I can’t really comment on them beyond giving you a picture of the CMR-W reticle for the Mark 6 1-6x which oddly is marked for immediate release while the scope is not. Here is an image of the 5.56 M855 version (It also exists in 7.62 M118LR). The layout of the reticle should already be somewhat familiar to most of my readers since most of the elements have been used in other popular designs before. There is a close quarters circle dot, or more precisely horseshoe dot in the center reminiscent of the Central element of the GRSC scopes. For rapid ranging 18″ shoulder width brackets appear below this at corresponding distances in the fashion of an ACOG. Added to this reticle are also windage bars that I and apparently many others had been soliciting. 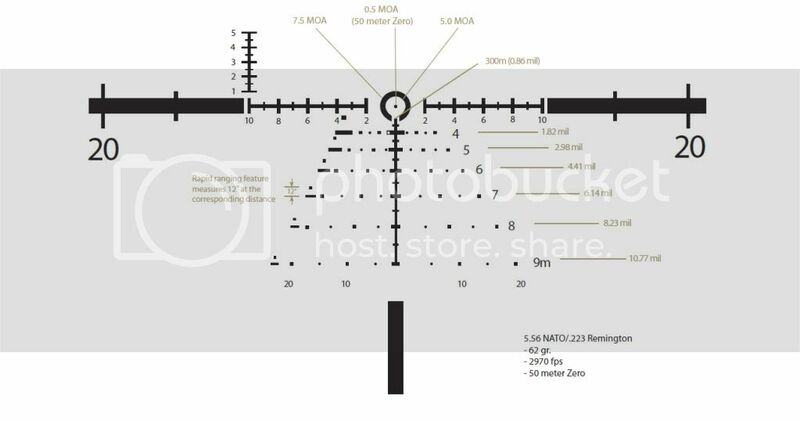 (In fact in early 2010 I sent Leupold a reticle design including many of these features with the intention of improving the CQ/T scope.) For those who prefer calculation ranging what appears to be a mil scale is also included on the upper part of the reticle. Really, a quite complete design allowing the operator great flexibility in ranging methods. It should be interesting to see how it performs in testing. Both the CQBSS and the Mark 6 1-6x will be getting a formal review from me with the S&B and PR 1-8x scopes and the March 1-10 when the logistics of obtaining all 5 at the same time are feasible. That looks to be pretty likely in early to late spring from what I can gather. This brings us to the other side of Leupold. As many of you know a few years back Leupold created an autonomous, smaller, and far more mobile tactical division in an attempt to regain a hold on the tactical market that, at that time, was clearly slipping from their grasp. As is evidenced by the plethora of new and relevant products released since then as well as the mob scene at the booth this strategy is clearly paying dividends. Meanwhile back at the substantially larger (yet still table deficient) Leupold / Redfield booth at the other side of the exhibit hall. A new product has been launched in the form of the VX-6 1-6x. This is a 1-6x scope with a clearly daytime bright flash dot type illumination at a very attractive price point. I was able to sit down and evaluate it next to my reference GRSC 1-6x. Clarity wise it seemed very on par with the GRSC though it offered a much more generous field of view. The turrets are a capped 1/4th moa variety that feature a finger adjustable mechanism that pulls up to allow user to set the zero. They felt good though not really great. 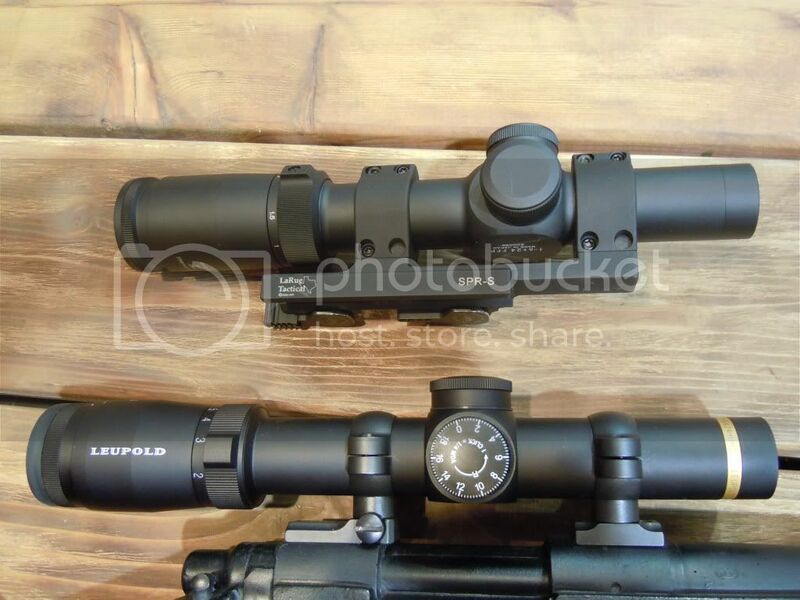 As you may note Leupold has switched to a 30mm tube on this scope as well as the much preferred euro type diopter. Unfortunately the reticles available do not include any ranging features. They are a German #4, a Duplex, and a Circle Dot post. Really, for the user not concerned with ranging this scope will be a very popular item. I cringe though at what it could be with the addition of the ranging capabilities brought about by a better reticle. Before I leave the VX6 1-6 I should mention its unique illumination system. In addition to being very bright indeed it is a digital mechanism that remembers the users previous setting. It also auto shuts off if left motionless for 5 min but includes a motion sensor to immediately turn of if picked up. A battery saver for all those who have burned though their batteries by accidentally leaving the scope on without the risk associated with automatically shutting off the illumination when it may be needed at a moments notice. Today I spoke with one of the Leupold reps regarding the VX-6 1-6x. This scope caught my eye at Shot by having a flash dot at a price point much lower than one can typically get this type of illumination. Its optics were also very good with regards to both clarity and field of view. The only rub was that it was not offered in a configuration with any ranging capability at all. I commiserated with the Leupold rep about this problem and he confided in me a secret (which I kept thank you very much, it wasn’t easy for me). He told me that he had been working for some time to get a ranging capable reticle in this scope. He was not sure that it would happen, but promised to keep me informed if it did. That brings us to today. I received an e-mail from the rep announcing success, at least partially, on his part. The VX-6 1-6x will be able to be purchased, with the Firedot SPR reticle, as an option, through the Custom Shop. 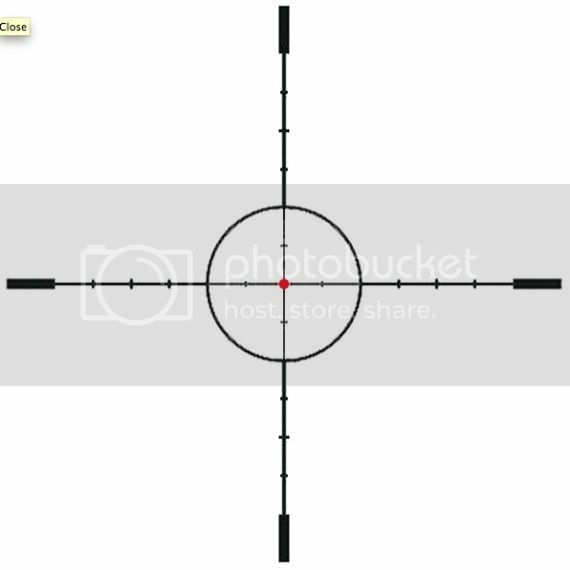 I have pictured this reticle below. It is a mil ladder reticle with a circle added and flash dot illumination. Leupold was pushing their Custom Shop a great deal at Shot this year, especially with regards to their CDS dial system. This is a dial system that can be engraved for your specific load. To be honest, I really hadn’t paid that much attention to the Custom Shop literature as, in the past, you really didn’t have much in the way of features you could change that mattered. Specifically, there usually was little or no reticle or adjustment choice. You could get the scope engraved or anodized, which might be great for a retirement gift, but that was about it. In the case of this VX-6, you will be able to add this mil ranging reticle and also change the adjustments to .1mil to match the reticle: quite an upgrade in functionality. To sum it all up, you will be able to get the VX-6 with a ranging mil reticle and mil adjustments. You will also be able to get an 8mil, one turn, zero stop, if you want it. This will all be through the Custom Shop only. I guess a cool anodizing job might be in order since you have to go custom anyway. Perhaps black with green fade and black splatter effect.